The 2016 Winner – Breanna R.
Tie-dying is always a hit! 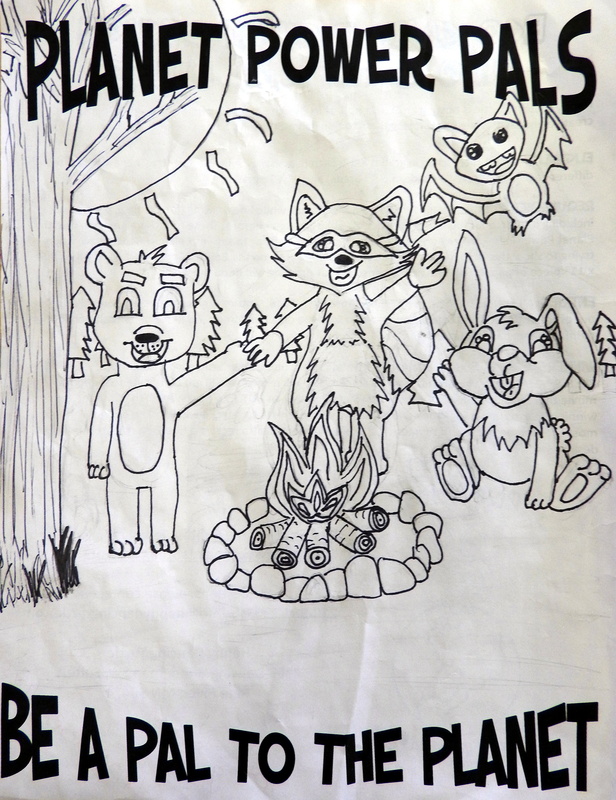 The 2017 Winner – Raena H.
This year marked the third annual Eco Camp T-shirt Design Contest. We ask students from across the state in grades K-12 to participate by submitting a black and white design that fits the upcoming theme. The 2018 Eco Camp theme is Birds of a Feather. Each age group in this summer’s camps will be represented by an environmentally-focused bird: Recycling Robins (Pre-K & K), Nature Nuthatches (Grades 1 & 2), Sustainable Sparrows (Grades 3 & 4), and Conserving Chickadees (Grades 5 & 6). Happy Dancing Turtle would like to give a huge shout out to everyone who submitted a design! We received 412 total designs, all from our K-5 students! We reformatted our age brackets to fit our contestants, enabling us to still give out all three prize packages. The new brackets were Grades K&1, Grades 2&3, and Grades 4&5. We were absolutely blown away by the artwork submitted by these students! 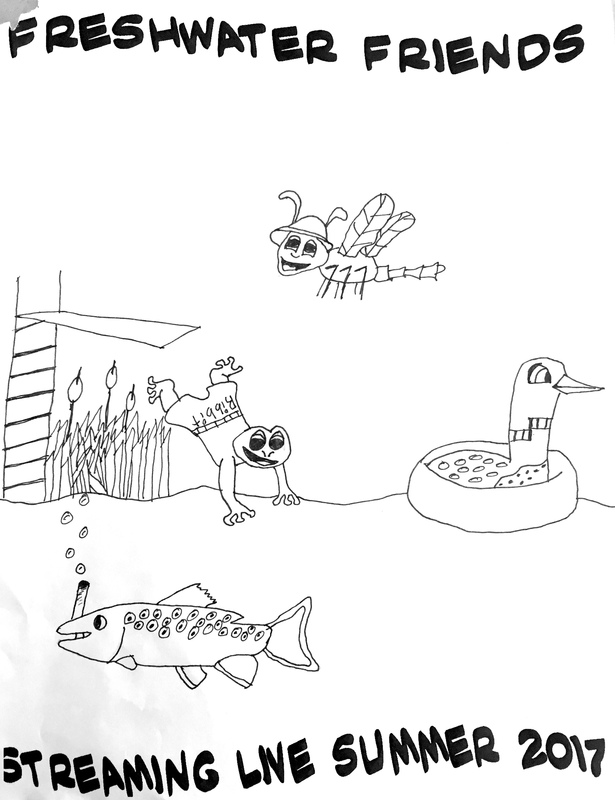 It was insanely difficult to pick just three from each age bracket to go on to the finals, but after long deliberation, we selected the designs in the slideshow below to go on to be judged by Audubon Minnesota. A huge thank you to our guest judges from the Audubon Minnesota – Katie, Kristin, & Ashley! They relayed how difficult it was to choose between these wonderful designs! Each of these winners will receive an HDT prize item, a $20 Gift Certificate to a local movie theater, and a $20 Gift Certificate to the Minnesota State Parks. In addition, this winner will receive an honorary Eco Camp T-shirt with their design printed on it! In the last several episodes, we’ve talked the benefits of following the pillars of soil health. We’ve spread the soil-health Bible far and wide, and now it’s time to start growing. In our latest episode, we discuss how to measure what your soil has in it. We discuss the “shovel-test” method and the chemical-test method, and once you learn what’s going on in your soil, how to add soil-amendments to maximize your soil’s growing power. We also talk on the subject of compost, how it’s made, and how we apply it. Moreover, we go into how to make our compost tea. Now, this isn’t your English grand-marm’s tea. It’s a fluid based mixture seeped with our very own homemade compost. Included is our weekly Garden Update, where Dave discusses moving towards (finally) a more warm season, and our very first WWOOFer. You can read more about Alayna here. Lots to listen to. Let’s get started! For those that are interested in a more detailed “recipe” of compost, you can find a pretty good video below. They cover the necessary “ingredients” for a well-functioning compost pile. We’d love to introduce you to our first WWOOFer. WWOOF stands for Worldwide Opportunities on Organic Farms. WWOOF connects farms with those interested in learning more about them and their practices. Hailing from the farming community of Winsted in central Minnesota, Alayna Karas has a first-person perspective of modern farming. Karas grew up learning the techniques her parents, and her parents’ parents (and THEIR parents) have been using for over one hundred years. Alayna stepped right into the planting season her first day. Yet, despite living on a century farm, bucking tradition seems to be in Karas’ nature. As a child, all of her siblings were expected to do their share of chores. One of these chores, Karas shared, was to take a calf, nurture it to maturity, and then eventually butcher it. She laughed as she told me that she could never bring herself to take that last step. It seems that Karas has embraced the ability to see what works for her and what doesn’t, and she saw something in her community that wasn’t working. Last week children, families, entire schools, and communities across the nation participated in Screen Free Week, endeavoring to not use any screens during non school and work hours. That meant no smart phones, no video games, no TV, no computers, no screens of any kind. Several of us here at Happy Dancing Turtle participated as well, including me and my two daughters, 8 year old K, and 6 year old B. Screen Free Week started on Monday, April 30, so the Saturday before that I told them all about it and that we would be participating. This news was met with some protest and with the girls watching TV or using their tablets every spare second they could! On Monday, I had an afternoon appointment, so their grandma picked them up from daycare and brought them home. When I arrived home, the girls were happily playing outside on the swing set. After a quick supper, we all headed back outside. The girls rode the go kart with their dad while I putzed around the yard. We headed in at 8:00 and got them ready for bed. After they were in bed, I turned to the giant pile of laundry that had amassed over the past week and got everything folded and put away. With the little time I had left until my bedtime after that massive undertaking, I finished a book I had started a few days before. Eco camp is a week-long day camp for children ages PreK-6th grade. We believe a passion for stewardship begins with cultivating a love of nature and being outdoors. We’ll discuss plants, animals, renewable energy, gardening, composting, recycling, and how to be a responsible caretaker of our planet. 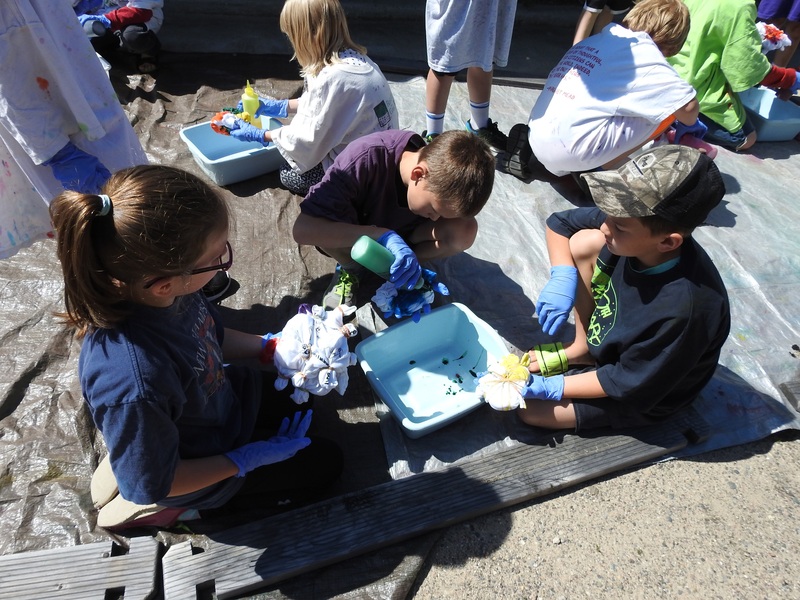 Children will be engaged in environmental education through a variety of lessons, activities, games, stories, crafts, garden experiences, outdoor play, healthy snacks, field trips, and more!